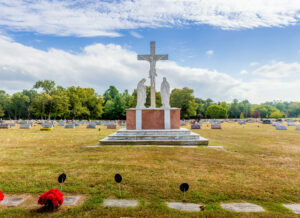 South Jersey Catholic Cemeteries have been serving Catholic families since before the erection of the Diocese of Camden in 1937. Through the Holy Scriptures we are taught that death is not the end but the beginning of everlasting life with our Lord Jesus Christ. We help our Catholic families during the most difficult time of their lives by providing a holy and dignified resting place for their loved ones’ remains. We strive to bring comfort, serenity and peace to our families who have entrusted us to eternally care for the remains of their dearly departed. We offer 15 locations throughout the 6 counties in southern New Jersey. In addition to our diocesan administered cemeteries, several of our parishes manage local Catholic Cemeteries serving their parishioners. Our locations are well maintained offering tranquil settings with beautifully landscaped and decorated grounds. We offer a wide range of in-ground and above-ground burial options such as cemetery plots, cremation graves, chapel and garden mausoleums, and cremation niches in glass or granite. Choosing a final resting place on consecrated grounds is your choice, your privilege and the right of every Catholic, as well as a confirmation of faith in our everlasting union with our Lord Jesus Christ.